Hi! It's Katie King from Queen of the First Grade Jungle! During the summer much of my time is spent daydreaming about how I want to change things in my classroom. Since I moved from Kentucky to South Carolina last year I had a brand new classroom to dream about. Here is a picture of my room from last year! Now, I am moving down the hallway, so new classroom again! One part of my classroom that I KNOW will remain the same is my Math Work Station area. I wrote ALL about my *love* for Math Work Stations HERE. ....and I ummmm still need to write that follow-up post! Eeeek! Sorry, I will get right on that! Here is how I organize my Work Stations that are in rotation. 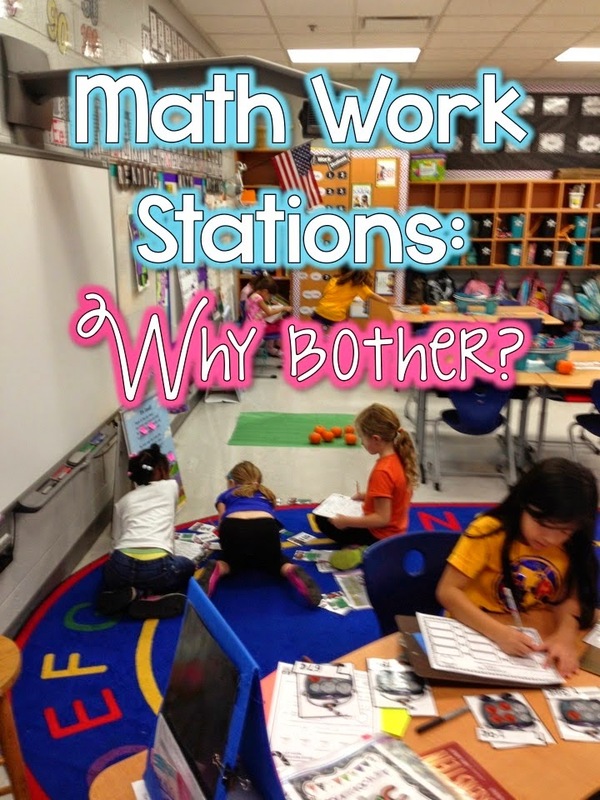 My students go to the two stations a day. They will take the basket to a desk, floor area, or bring it to my small group table if it is time for them to be with me. Here is the link for theses Free Labels. Here is another way that I use the labels. The students names are rotated daily. The two numbers by their names coordinate with the basket that they need! I hope having a peek into my room and these labels might help you in the groove for next year! Love the colors of your room! Thanks for the freebie! Thank you for sharing these are GREAT! The labels are beautiful- I plan on using them! Will you also be posting the circle format as pictured above on the math work stations board? I team teach with another first grade teacher and this is the exact same way that we run our math stations! We love it. It's so simple and easy for the kids to read and interpret as well as for us to change quickly! Came for the labels, but ended up going down the math center rabbit hole and getting some great ideas for the coming year. Thank you! Thank you for the cute labels! The baskets on the shelves are so very cute! What types of shelves are those? They look like closet shoe shelves like I have been using. However, I need to trash them because they have seen better days! I am in the market for something similar. Or...maybe I just need to buy new replacements.